Statistics Canada reported exports declined by 3.8 per cent during the month, led by a slowdown in energy products that have now declined for five months in a row. Coupled with a 1.6 per cent increase in imports on the other side of the ledger, that pushed the overall trade gap to $4.6 billion — the highest monthly total on record. 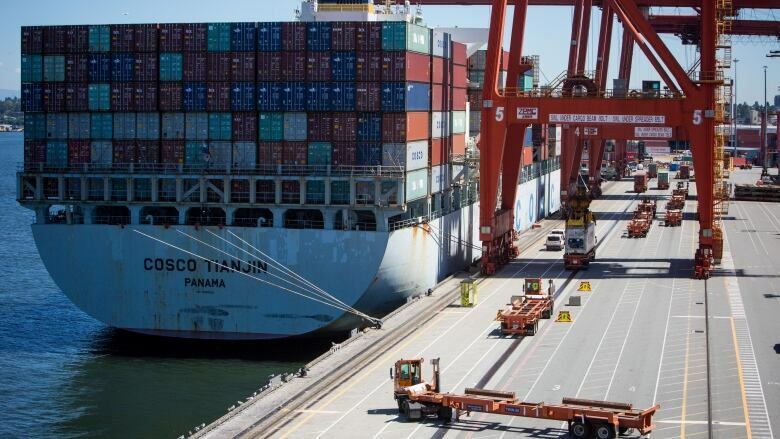 "Looking beneath the headline numbers, the broad-based weakness in exports and the negative volumes print is discouraging," TD Bank economist Omar Abdelrahman said. The trade gap grew because Canada bought more from and sold less to countries that aren't the U.S. If Canada's largest trading partner is stripped out of the numbers, Canada's trade gap looked even wider during the month — $6.4 billion. Canada's trade gap with the U.S., meanwhile, narrowed to $1.8 billion. Despite large monthly deficits toward the end of the year, for 2018 as a whole, Canada posted an annual trade gap of $21.7 billion, down from $24.6 billion the previous year because of a strong start to 2018. But a yawning trade gap was no monthly blip south of the border. The U.S. Department of Commerce reported Wednesday the country's trade gap widened by 19 per cent in December to $59.8 billion US — it's biggest monthly amount in more than a decade, and enough to bring the U.S. trade gap in goods to its biggest annual gap ever, at $891.3 billion for 2018 as a whole. If services are included, the U.S. trade gap shrank to just over $621 billion for the year. Even that is a 12.5 per cent increase from the previous year's level. The trade gap is a frequent target for President Donald Trump, because he thinks it signifies other countries are taking advantage of the U.S. by shipping billions of dollars worth of goods to the country while not buying as much in the other direction. It's why he has slapped tariffs on hundreds of billions of dollars worth of goods from dozens of countries, in the hopes of levelling the scales, as he sees them. But Friday's figures show the U.S. economy is still importing more than ever from the rest of the world. A big reason for that is the persistent strength of the U.S. dollar. It makes foreign manufacturers look even cheaper, and gives U.S. consumers even more purchasing power when buying foreign-made products versus domestically produced ones. "Broad dollar strength is only going to make the deficit worse despite Trump's protestations," Scotiabank economist Derek Holt said after the numbers were released Wednesday.